By GreenEyedLillies on May 28th, 2009 . Filed under: Accessories, Baby, Bed, Bath, Body, Gifts . Great For makeup, travel, Diaper Bag Extra, Clutch, ipod, Reuseable Grocery Bag Holder[keep in car]. so many uses!! SO SWEET, I Cant Stand it!!! 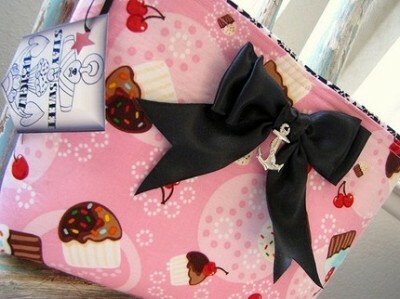 Made from Cotton “Cupcakes/Cherries” Fabric. Inside is lined with a cotton black on white “Damask” Print.outside of bag is decorated with a black Satin Bow & Anchor Charm. Bag measures 9X7. bag is double stitched and lined with stiff interfacing to give the bag shape and durability! Magnetic Snap Closure. I really really really love all of her stuff! I want! *throws tantrum* Sorry, I have kids and I forget that kind of thing does not work for adults. « A Giveaway Everyday in June! Fairly interesting post. Couldn’t be written much better. Browsing this post reminds me of my old friend. She always kept babbling about this. I will forward this post and I’m pretty sure it will be a good read for ’em. Thanks for sharing! Can I just answer what a release en route for locate someone who really is familiar with what theyre discussion about on the world wide web. You certainly know how to transport an matter to light plus make it important. Additional community call for to study this plus realize this side of the story. I cant believe youre not extra fashionable because you positively have the gift. Great post, will come back again to read more. Thx.